Continuing our ride through the best lunch-time bites in Melbourne, we head to Darac Bar and Grill, located on the northern outskirts of the CBD. Here is a place that is fun and visually appealing, providing a relaxed setting and a simple lunch-time menu of western influenced Korean and Japanese meals. There is no attempt to hide the fact that this was once an old warehouse with open red bricks and timber providing most of the interior – a couple of delightfully decorated feature walls being the exception. Adding to the charm are the homely relics lining the room. This includes an original singer sewing machine, vintage gramophone and a host of antique roadshow bric-a-brac. When eating for lunch it is a simple concept. Put your name on the top of your little sheet of paper and select your meal in three easy steps as per the blackboard below. 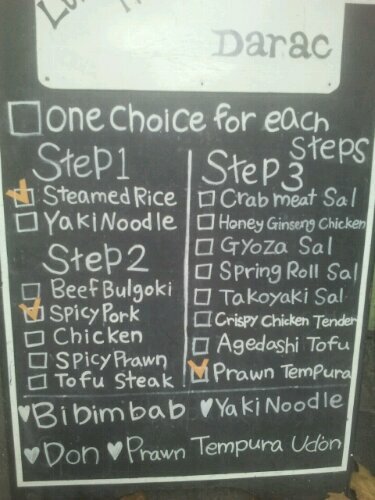 Step one is a straight forward choice between noodle and rice. Step two, you pick your main dish and step three, your side dish where you can add a healthy(ish) option or forget about the diet for a week. At the moment, my favourite combination is the steamed rice, into the spicy pork, into the crab salad, however I say that knowing it could easily change. My one true recommendation is to resist the temptation to order the large size and stick to the medium. Not only is the $9.50 medium sized meal perfectly fulfilling, it is just the perfect mix of everything.